A MOD police officer recently returned from a six-month mission to train Afghan National Police (ANP) recruits says she is optimistic about the future of the country. When you are training you have to put over a very positive attitude and trust the Afghans themselves to be capable of running their own security forces. They understand what’s right and what’s wrong and good and bad, and it’s about breaking the cycle from the past. It’s about being brave and standing up to the problems they see. That’s where our training can help; we interact with the ANP at all levels and seek to break old patterns of behaviour. They are beginning to understand that what they are trying to achieve is to build up trust with the local populations. They know they have bridges they need to rebuild. T/Insp Underwood was well-placed to train recruits, having spent much of the previous five years training MOD police officers at the Force HQ at Wethersfield in Essex. Gradually through education things will change,” she said. “Certainly the majority of the people I met were enthusiastic, even those who have been in the ANP for some time but who were having their first training. You could see the changes in them. One of my top recruits was someone who had lost a leg after being injured fighting the insurgency. He’d been in the ANP a long time but was receiving his first training, yet his dedication and attitude were fantastic. Establishing the Rule of Law in Afghanistan is obviously key to the country’s future stability, and with my training and policing skills I knew that I had something to offer,” she said. “The training centre was up and running when I arrived but we knew we needed to push it on. It’s such an evolving beast, it’s constantly changing, adapting and improving, and it has to in order to deal with the challenges it faces. Classes have big numbers,” she added. “Here in the UK we had a maximum of 18, but there they were 35 to a class. Another issue is that nearly all of the students are illiterate, so that in itself raises problems - conventional teaching practices go out the window. You could do very little lecturing because the students wouldn’t be able to absorb it. Instead everything was procedure-driven with lots of role play and hands-on stuff. It was about looking at ways they could absorb the information and really enjoy it. We had a core of Afghan instructors working with us that could reinforce and consolidate that and eventually these instructors will be doing all the training themselves. The students also had 64 hours of literacy instruction over the eight-week course, and that’s another key element for success. It’s a driver for recruitment, it empowers them. One of my defining moments was to see an ANP trainee, an existing officer who had never had any training in the past, come up to me with his workbook to show he had written his own name in his own language for the first time. To see how proud he was, it stopped me in my tracks, because that’s a huge key to success. The environment that the ANP officers have to work in means that the training is by necessity a mix of civilian policing and more military tactics and procedures as well. They go on patrol as police officers but anything could happen. So, if they are fired upon, they have to be able to respond to that, use their skills and then deal with the aftermath. My team concentrated on the civilian policing aims for the first weeks of training, whilst the Army concentrated on the areas of their expertise, then it starts to all join up and everything we do after that we do together. 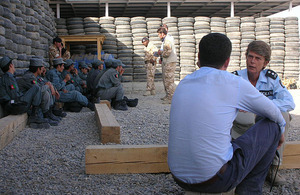 Among the skills taught to recruits are baton-handling, handcuffs use, arrest procedures, proportional use of force, custody procedures and the Afghan constitution and law. They also learn weapon-handling, marksmanship and mine and bomb detection. It’s an eight-week course but the development after that is constant. The HPTC is a starting point; it’s not the end. There are teams of British soldiers and Royal Military Police who go out around the patrol bases and checkpoints and continue the training. 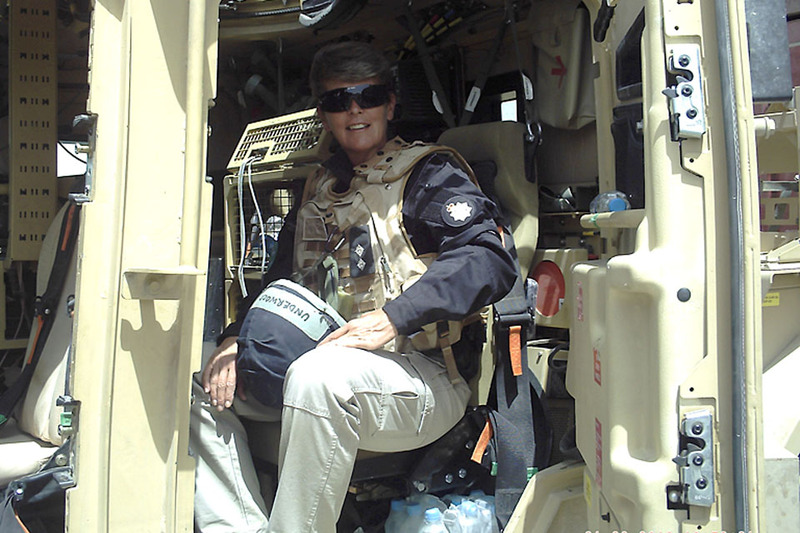 But it all comes back to being a police officer and working with the local community and there are now areas in Helmand where they can do that job.